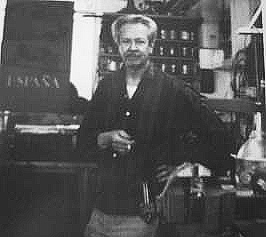 He was among the first craft jewelers in Greenwich Village, New York City. Rebajes came to New York in 1922 from his native Dominican Republic at the age of 16. Knowing little English, he found a way to support himself working in cafeterias. In 1932, Francisco married Pauline Schwartz. Still without money, he and Pauline were given shelter, in a basement, from a kind friend. Here is where Rebajes used an old set of plumbers' tools to create a collection of animals from tin cans. Those sculptures were then exhibited on an ironing board at the first Washington Square outdoor show. The result of this showing ended with the director of the Whitney Mueseum, Juliana Force, buying all of the pieces Rebajes created. Next spawning Rebajes' first store on 182 W. 4th Street in Greenwich Village. With gaining success and popularity in the 1950's, Rebajes opened a modern store in 5th Avenue at 37th street. This store was elaborate and modern in design. Later on in his life, Rebajes became more interested in sculptures rather than jewelry. His works were based on the Mobius Strip, theories of synchronity and movement. While creating these steel sculptures, he applied for patents in numerous coutries for a discovery that would nominate him for a French "Academy of Science" Prize. In 1988, Rebajes' wife passed after a struggle with Alzheimer's. Rebajes, at that point, had to sell all of his tools and machinery to cover the costs of Pauline's care and his sculpture. In 1990, Rebajes made a presentation of his Mobius work at MIT. Either disappointed with the result or satisfied that his research was complete (no one really knows), he returned to his hotel room and ended his life with the very same acid used to make his beautiful metal art. References: Otto R. Bade, Patricia Riverton Lee. "Uncle Frank - The Story of Francisco Rebajes"
Today, the creations of Francisco Rebajes live on. His work has been displayed in museums around the world including the Smithsonian Institute in Washington DC. A man of great vision and accomplishments, he is now recognized as one of the founders of the American Wearable Art Movement, an important movement in the history of American art that includes other very important artists like Sam Kramer, Art Smith, and Paul Lobel, who's studios were steps away from Franks. Other famous names within the movement are Alexander Calder, Magaret De Patta, Peter Macchiarini, and Harry Bertoia to name a few.